Hoping to escape wildfire smoke permeating much of the Canadian Rockies, Zosia Zgolak and I headed to Montana for the August long weekend with plans to hike in and around Glacier National Park. After camping the previous night just outside the park, we drove to Two Medicine Lake on the morning of 5 August 2017 to have breakfast near the boat docks before heading to the trailhead located within the nearby campground. 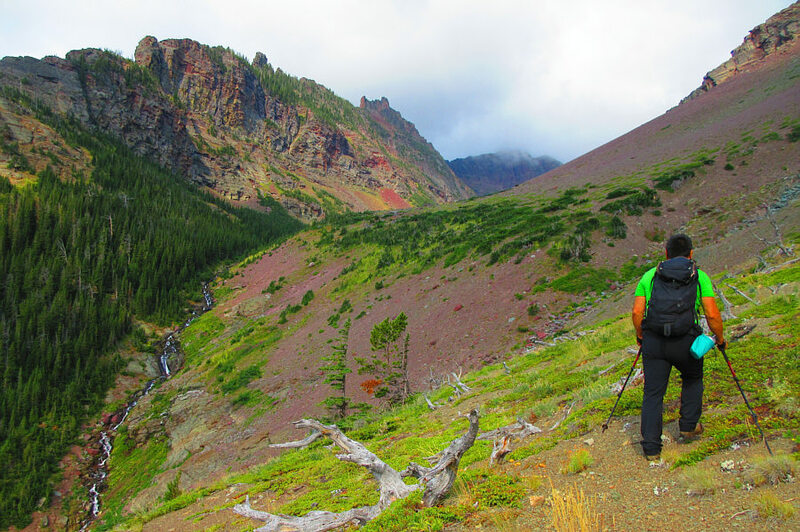 I had an ambitious plan to climb Red Mountain and a couple other peaks near Pitamakan Pass all in a single day, but as it turned out, Red Mountain alone proved to be more than I had bargained for. For reference, we used the route description from summitpost.com. Starting at the trailhead, we crossed the bridge over Two Medicine Creek and turned right at the T-intersection just beyond (the left turn to Two Medicine Lake north shore trail was closed on this day because of bear activity). 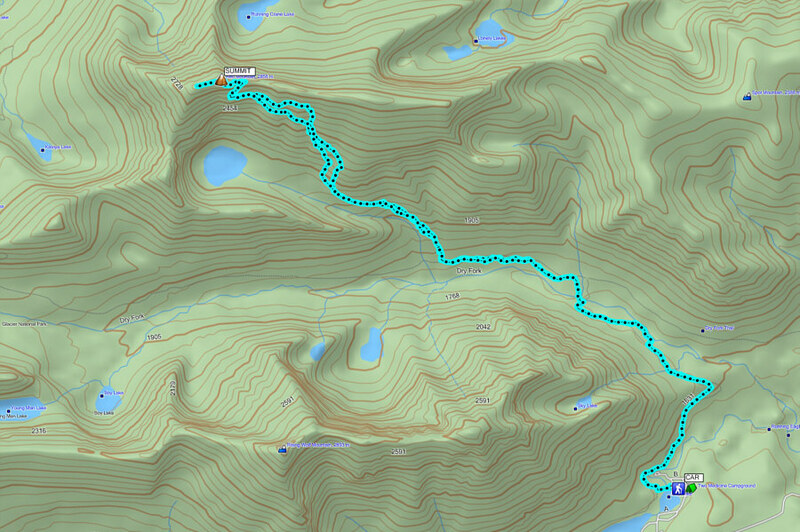 This trail winds around the east end of Rising Wolf Mountain before dropping down to cross Dry Fork Creek. After the creek crossing, we reached another T-intersection where we turned left and continued along the well-maintained trail leading to Pitamakan Pass. 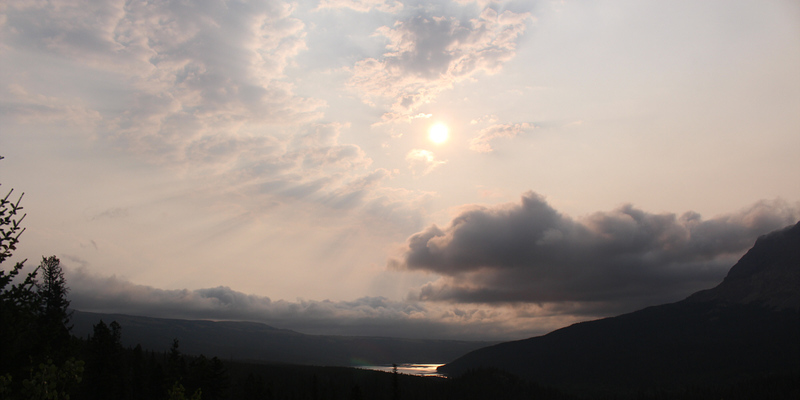 Because of wildfire smoke in the air, the morning sun casts an unusual light over Lower Two Medicine Lake. Zosia prepares to cross the bridge over Dry Fork Creek. 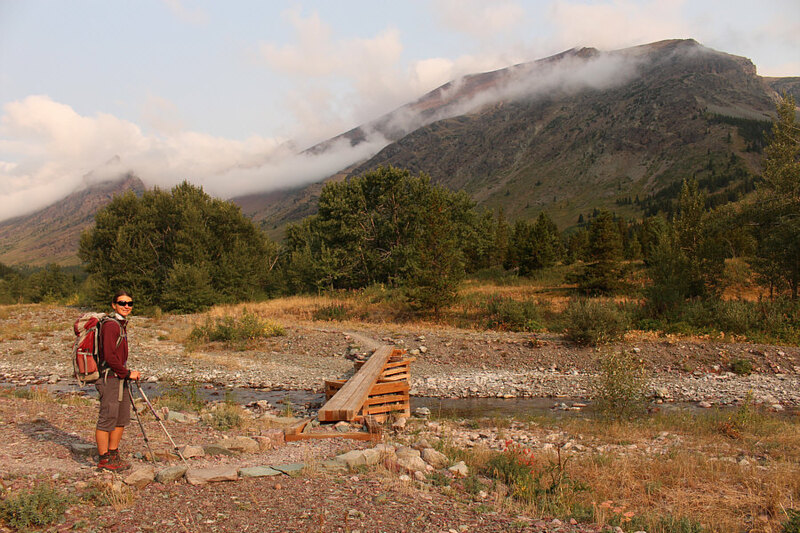 About 1.5 kilometres west of the second T-intersection, Zosia and I left the trail and headed northward up semi-open slopes aiming for the basin south of Red Mountain. 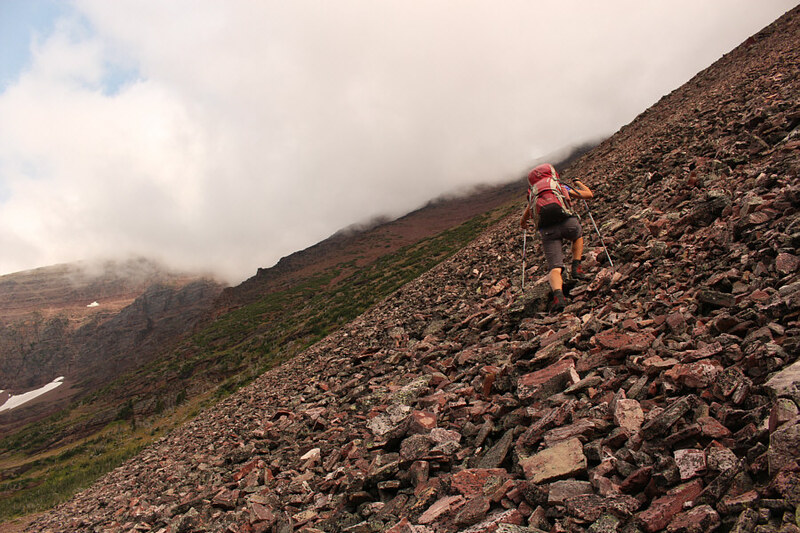 Upon entering the basin, we began grinding straight up a vast slope of tedious and demoralizing red rubble with the odd patch of krummholz and a dry gully helping to alleviate some of the drudgery. When we climbed high enough to see the unnamed lake at the head of the basin, we veered westward and traversed across south-facing slopes in hopes of finding a "scree-covered ramp that angels [sic] towards the notch", supposedly a key feature in the summit ridge as per the route description. 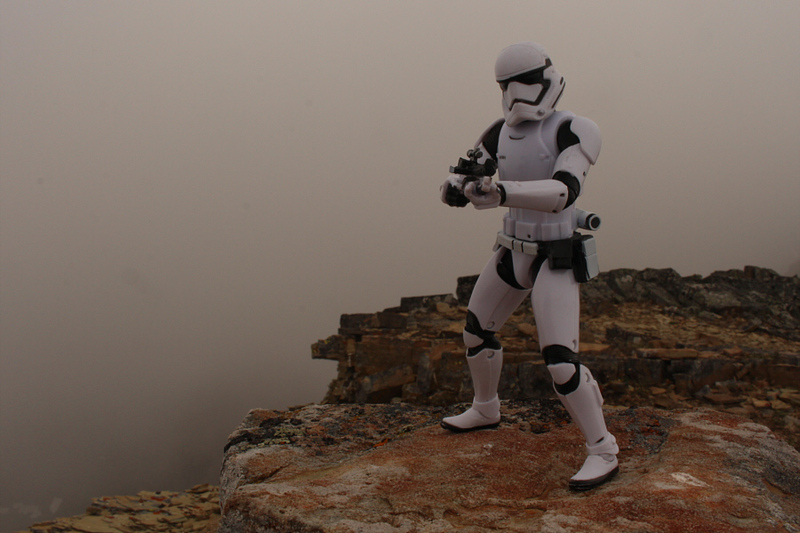 Unfortunately, foreshortened views and low cloud cover made it difficult to see any distinguishing features on the ridge top, and we never really figured out the exact location of the so-called ramp and notch. Instead, we kept traversing--we were pretty much route-finding on our own at this point--until we reached a spot where big cliffs made it increasingly difficult to continue westward. 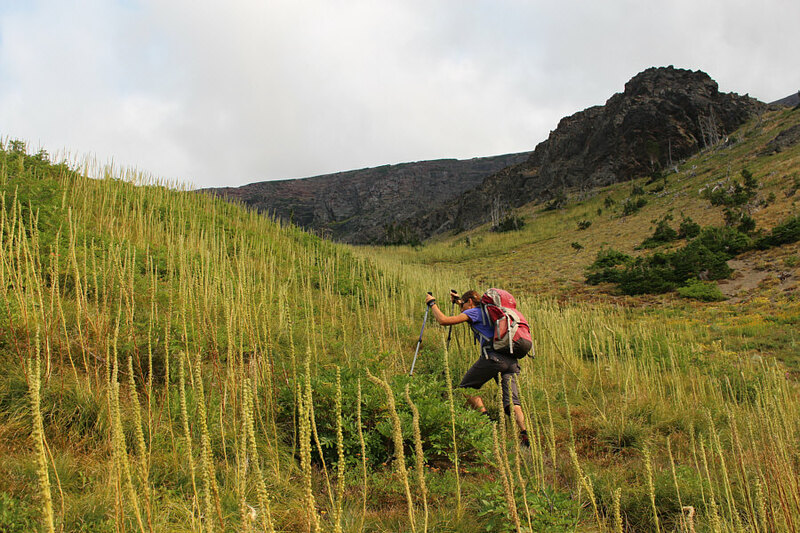 After leaving the trail, Zosia climbs up a slope covered with bear grass. 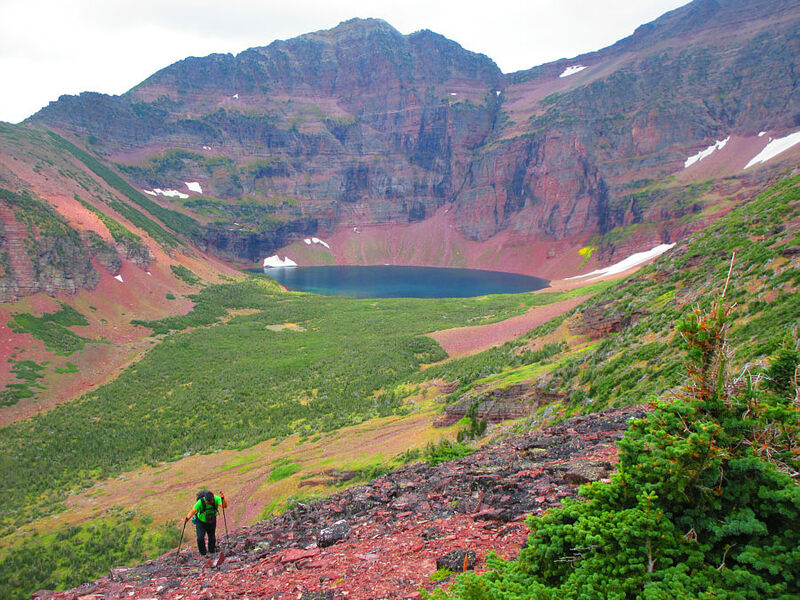 Sonny approaches the entrance to the basin south of Red Mountain. 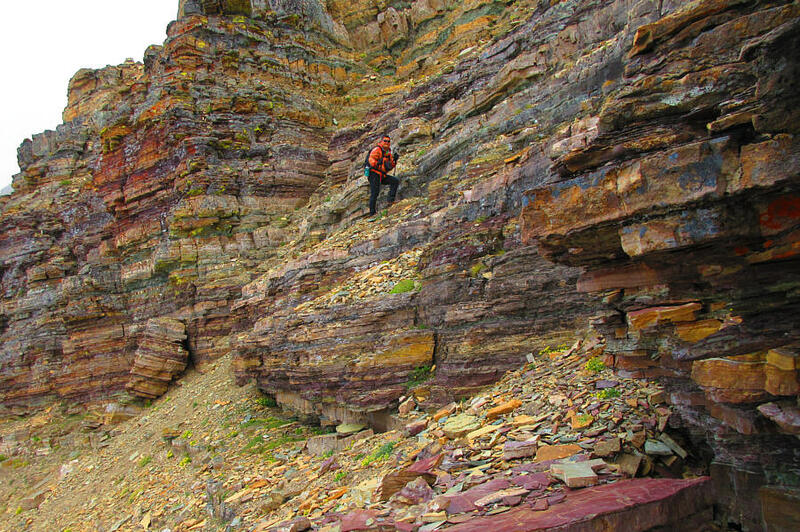 Zosia grinds her way up the red rubble slope. The summit of Red Mountain is somewhere in the clouds to the left. 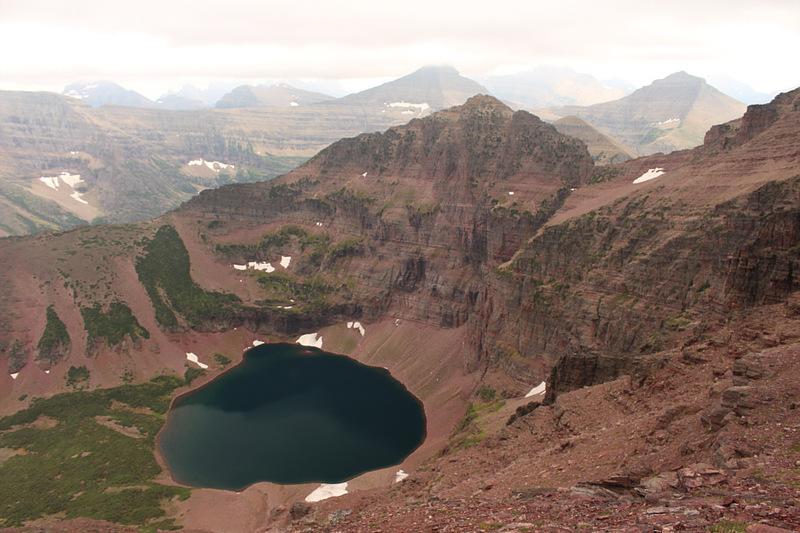 An unnamed tarn occupies the basin south of Red Mountain. 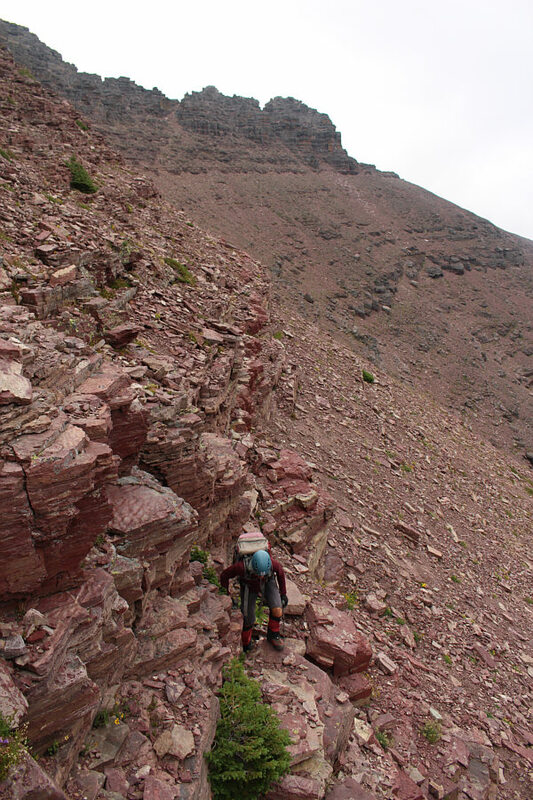 Zosia tries to avoid the loose scree by climbing up this dry gully. Sonny traverses across the south-facing slopes. Here is an aerial view of the unnamed tarn in the basin. Partially visible at distant centre is Flinsch Peak. The connecting ridge from Red Mountain to Pitamakan Pass and Mount Morgan (distant right) can be partially seen here. Zosia continues to traverse across the south-facing slopes. The complexities of the ridge top are more evident here. When it appeared that Zosia and I had reached an impasse, a quick glance upward revealed a reasonable ascent route angling up and back eastward. This led us up to the ridge top where we again turned westward to complete a broad zigzag on the upper slopes. 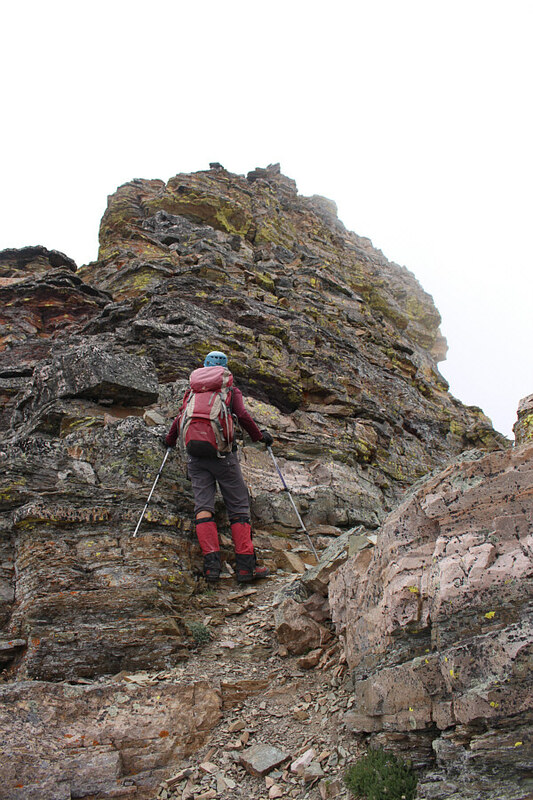 Avoiding more complex terrain on the ridge crest, we once again traversed across the south face until almost directly under the summit. For the final 50 vertical metres before the summit, we scrambled up a series of ledges in a wide gully with lots of loose rock. 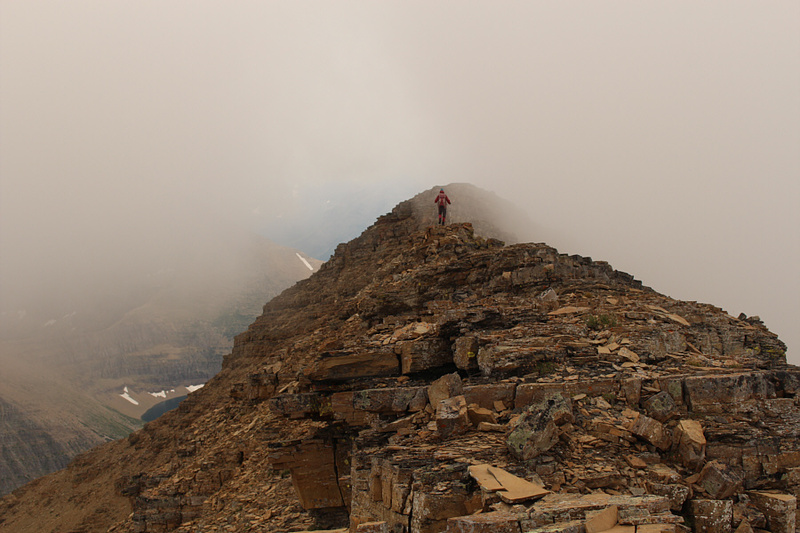 Disappointingly, summit views on this day were limited by cloud cover and perhaps even smoke. Zosia begins climbing upward again. The route eventually veers to the right in the photo. Zosia runs into a gendarme along the ridge top. She would eventually traverse to the left to avoid climbing over the gendarme. 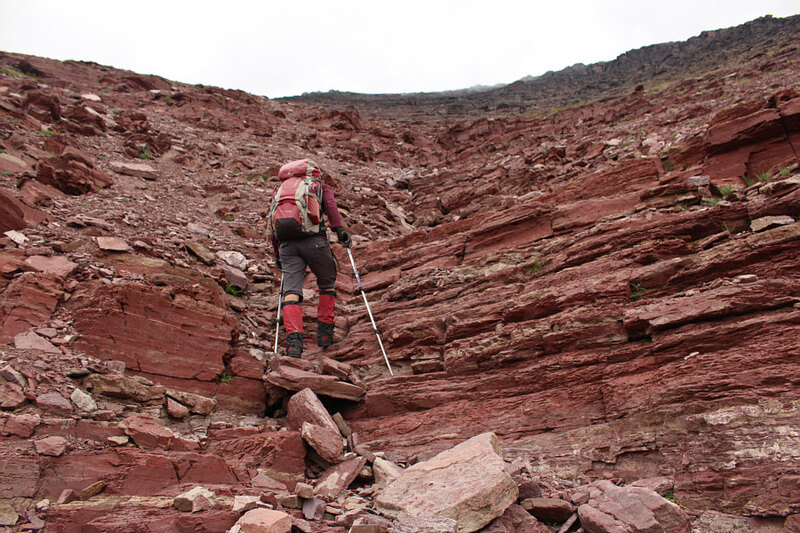 On her second traverse across the south face of Red Mountain, Zosia walks under a huge rock flake. 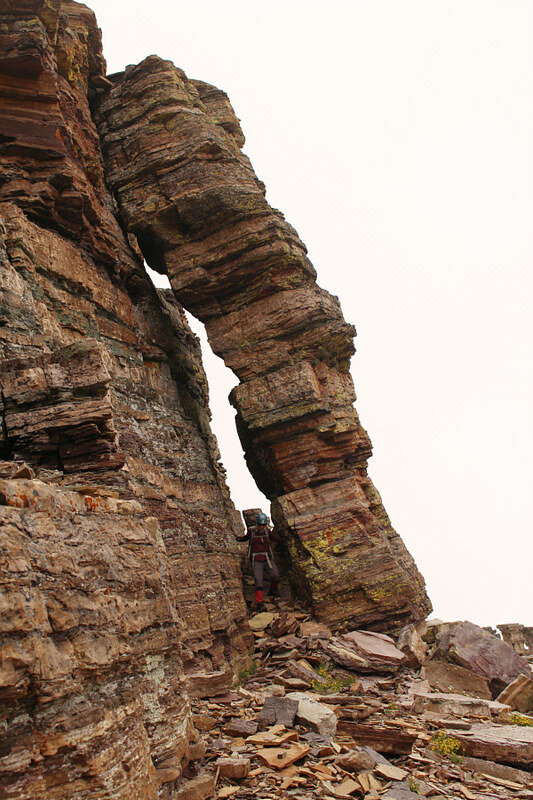 At the end of the second traverse, Sonny climbs up a series of ledges in a wide gully just below the summit. 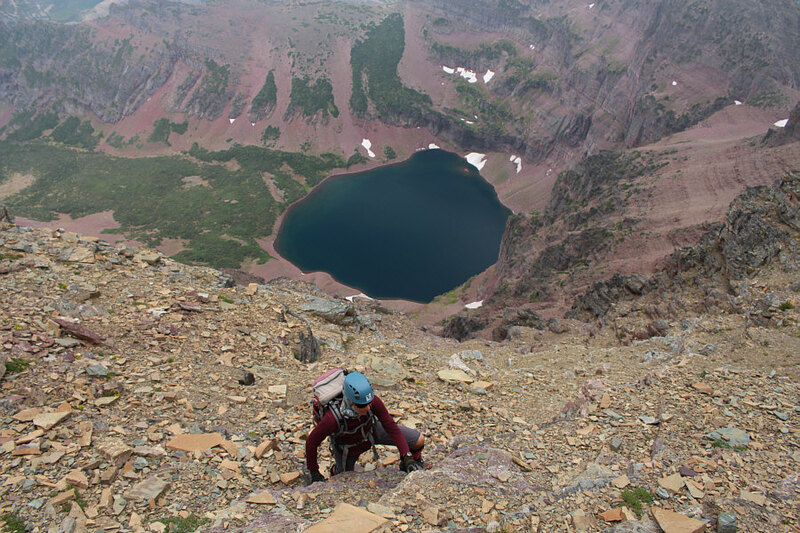 Zosia carefully ascends loose terrain high above the unnamed tarn. 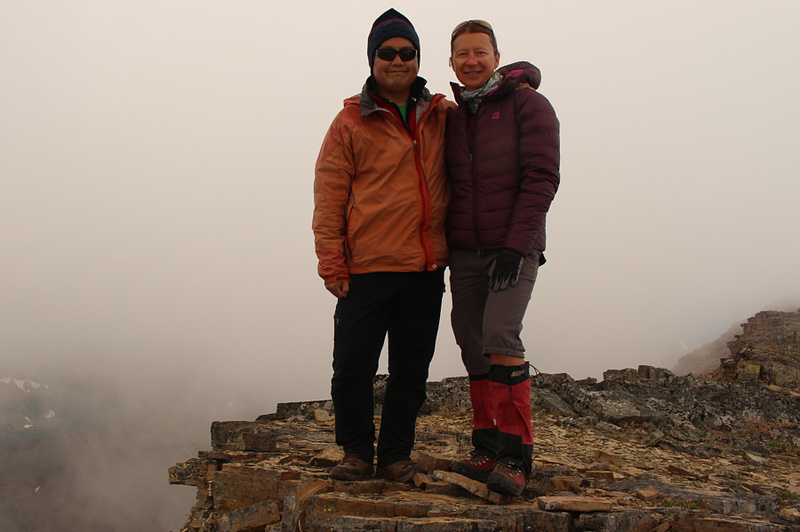 Sonny and Zosia stand near the summit of Red Mountain (2852 metres). After tagging the summit, Zosia and I took a very short break before continuing to the west end of the summit block for a peek at the connecting ridge to Pitamakan Pass. 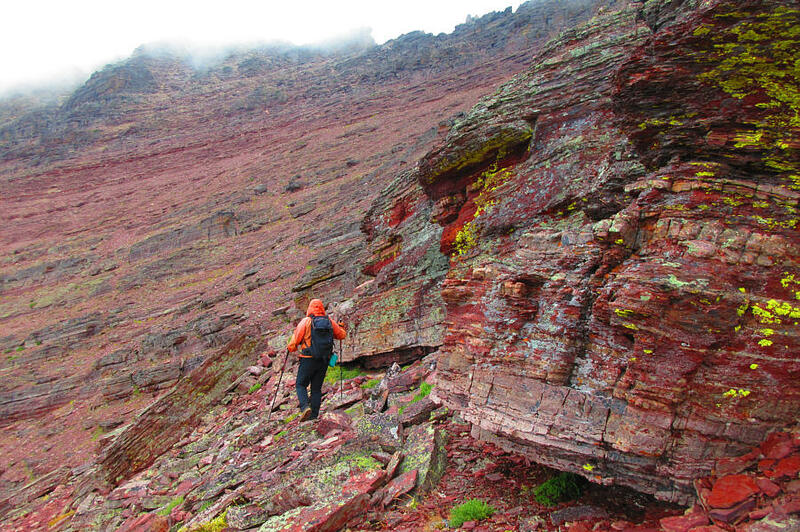 Even before reaching the summit of Red Mountain, I had already gotten a good look at this ridge, and it looked quite challenging. Given the lateness of the day and the overcast weather, we decided to forego Pitamakan Pass and simply return the way we came. Leaving the summit, we retraced our steps more or less back to the bottom of the basin and down to the trail. 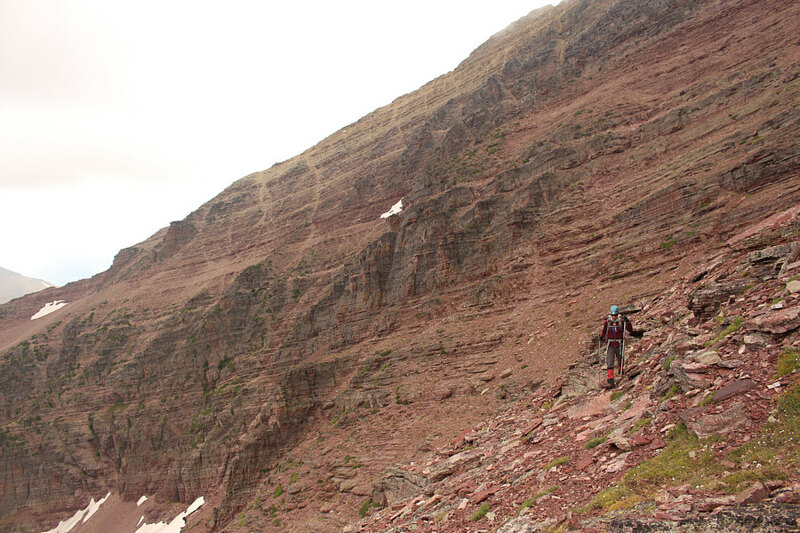 I consulted my GPS unit several times to keep us on track, but otherwise, our descent was largely uneventful. The long hike back to the trailhead was equally unremarkable, but after all the scree-slogging and route-finding we had on the upper mountain, it was nice to put our mind on cruise control to end the trip. Zosia heads to the west end of the summit block. 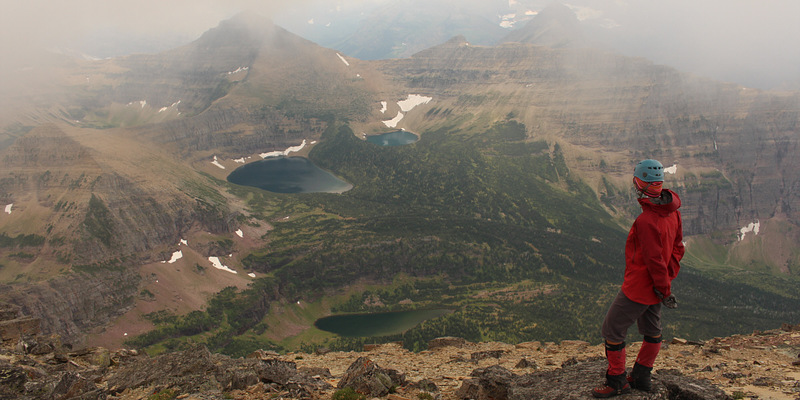 From the west end of Red Mountain's summit block, Zosia looks down on Pitamakan Lake (largest), Seven Winds of the Lake (smallest), and Katoya Lake (greenish). 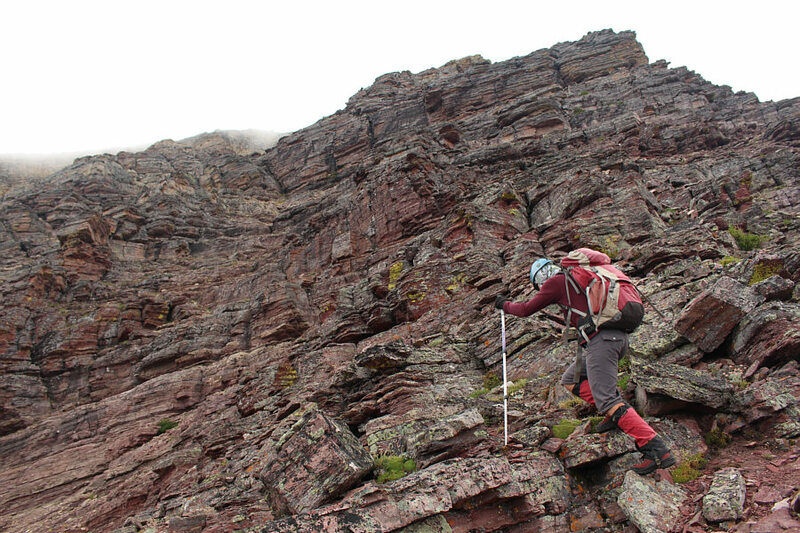 Zosia works her way down the complex south face of Red Mountain.